As my wife’s sous chef and a proficient cleaner upper, I have only really dabbled at times in the cooking department. I had traditionally limited myself to grilling meats and such. However, somewhere along the line I developed a specialty of my own for one of my favorite main courses, Chicken Marsala. It’s actually relatively easy to make, although does require about an hour of time to prepare. The first step is to simply chop a regular onion. I usually have my wife do this since onions sometimes make my eyes watery. You then melt the butter & heat oil in a 12” skillet or casserole dish at medium-high heat. Then add the chopped onions and sauté for several minutes until they soften. Next add the mushrooms and sauté until they start to reduce slightly in size and the mushroom juices fill the pan. While you are doing this, you concurrently will want to bake the chicken breasts in the oven. This usually takes approximately 50 minutes, depending on the thickness of the chicken breasts, at temperature of 350 F.
Referring back to the mushroom pan, next add in the Marsala wine and stir occasionally for 5-7 minutes while the wine reduces in half. Once that has taken place, add the chicken stock to the pan and again stir while the combined Marsala/chicken stock reduces again by half. This should take another 7-10 minutes. I suggest adding garlic, although this is more of an optional ingredient. Also add a touch of salt and some pepper to the sautéing ingredients, while the chicken finishes baking in the oven. At last, once the chicken is done, slice into small pieces and add to the sauté pan. 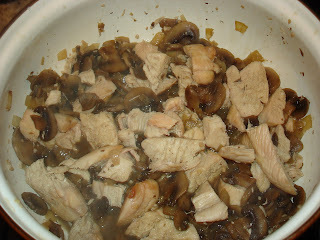 Allow the pieces of chicken to soak up and mix well with the Marsala/chicken stock in the pan. When ready, you may serve with grated parmesan cheese, which I think does add to the flavor. This recipe is appropriate for 2-4 people.